In this article, we will take a look at the grenades of Command & Conquer. 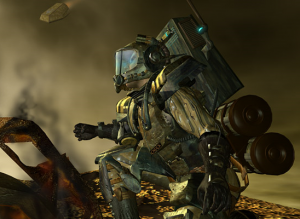 Grenades have shown up in a variety of forms throughout the series, mainly in the Tiberium universe. The first grenades of the series showed up in virtually identical forms in Tiberian Dawn and Red Alert 1. 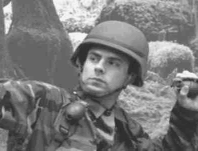 The unit cameos depicted the grenades with an old fashioned pineapple design. The iconic segmented design on these types of grenades was actually used to improve grip, but was originally intended to aid in fragmentation in the Mills bomb, the earliest “safe” hand grenade with a pin. Later experimentation proved that the grooves had a far better effect when they were etched on the inside of the shell rather than the outside, but this was too expensive to do with the technology of the time. Some grenades are still made with a pineapple surface, but most no longer feature it, so although it isn’t necessarily anachronistic, it does present an older ambiance. This may be more suitable to the World War II type atmosphere of Red Alert, but is less suited to the more science fiction setting of Tiberian Dawn. 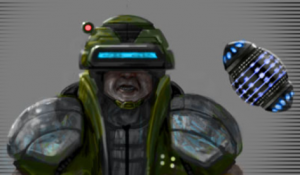 Interestingly, a larger image of the Grenadier in the Tiberian Dawn manual shows a smooth surfaced grenade. Grenades took on a vastly different form in Tiberian Sun in the form of an explosive discus. The disc grenades could skip across the ground if they missed their target. A discus-shaped grenade with impact fuses is not a unique concept, they were developed by Germany during World War I, but were deemed ineffective. The modern American M67 weighs 400 g (14 oz) and can be thrown about 35 m (115 ft) by an average soldier. A track and field discus weighs 2 kg (4.4 lbs) and can be thrown at least as far by an average athlete. This seems to indicate that a discus grenade should be able to deliver more firepower just as far as a regular grenade. Additionally, in a video during the campaign, a Disc Thrower can be seen in action, during which sounds like a small electric motor can be heard and some sort of mechanical device is visible on his arm, this is likely a machine used to aid him, which may further increase his range and decrease fatigue from repeated throws. However, real modern soldiers who use grenades as a primary weapon would equip a grenade launcher that has far superior range capabilities, accuracy, and in the case of an automatic grenade launcher, a much higher rate of fire. Grenades used with a launcher also have a much more compact design, lacking a safety pin and handle, making them easier to store in bulk as well. Nevertheless, had grenade launchers never existed, discus grenades might not be a completely unreasonable development path. Grenade launchers made a few appearances in the series, the first being the single Yuri’s Revenge mission in Hollywood where one could recruit Sammy Stallion. This grenade launcher was as ridiculous as could be expected from a parody character, firing what might be described as mini-nukes that could decimate structures in seconds. Renegade featured a weapon that resembles a revolver type grenade launcher, but its cylinder is actually a fully detachable drum magazine holding eight shells. It has a very unusual overall design where the rounds do not even line up with the barrel. The range of this weapon is far too short, although canisters visible on top may indicate that it uses compressed gas to launch the shells instead of an explosive charge as would be typical. Rangers in Generals could be upgraded with Flash-Bang Grenades. These seemed to be fired from an under-barrel grenade launcher, although real flash-bangs are thrown as the stunning effect caused by these weapons does not last long enough to bother with them at long ranges, the debilitating effect clearing up after about five seconds. Evidence indicates that their original intended use in the game was part of the scrapped POW system, which allowed the player to capture surrendering enemy soldiers. Unfortunately, in the released version, flash-bangs are extremely lethal anti-infantry weapons, which is the opposite of their intended use in the real world. Tiberium Wars featured GDI Grenadier Squads and Nod Confessors with Hallucinogenic Grenades, while Kane’s Wrath added Zone Raiders with sonic grenades. The grenades of the grenadier squads are supposed to have rocket propulsion to gain better range and limited AI guidance systems to direct the grenades in through a building’s windows. Greater range and accuracy could be more easily achieved by just using a grenade launcher. In fact, the grenades could keep their rockets and guidance and still be improved in accuracy and range by being fired from a launcher. There is really no reason for a dedicated grenadier unit to still be hand throwing their grenades with the level of technology available at the time of the Third Tiberium War. Interestingly, the hallucinogenic grenades are probably the most realistic among the three. Nevertheless, gas grenades would be far more useful indoors, where the wind can’t blow the cloud away harmlessly or back into the face of the thrower. Again, a grenade launcher giving them better range would make friendly fire less of an issue. Realistically, it is unlikely hallucinogenic grenades would be very reliable, and gasmasks would almost certainly be immediately deployed once the enemy became aware of their use. On the other hand, if the gas is capable of penetrating a gasmask, it would be far too dangerous to Nod’s own forces to deploy them outside at throwing range. The Zone Raiders actually do have launchers with better range and projectile speed than the grenadiers, but the launchers are significantly less accurate than the hand-thrown grenades. The sonic weapon itself is unusual as well. Sound is only pressure waves moving through a medium, so if a sonic burst is powerful enough, it’s just a normal explosion, while a low-powered burst would be a stun grenade. Other sonic weapons in the series use resonance frequencies to damage targets, but establishing a resonance with a single sonic burst grenade is not possible.